The killings in Kailali on 24 August exposed just how much of the content on the social web can be manipulated with fake images. Interestingly, the violence coincided with the launch of South Asia Check, a media fact-checking initiative of Panos South Asia. We were putting together our findings, tweaking the online settings of our site, and scrolling and refreshing our Twitter timelines hoping to find clues into some more fact checking when the social media began to be filled with news and images from Tikapur of Kailali. Anger had been building up in the western Tarai over the demarcation of provincial boundaries for more than a week, and there was a spike in images of arson and clashes being shared on social media. Soon, there were gory images of policemen being lynched or set on fire. The death toll was initially cited in the mainstream press as 21 and later corrected to nine, even though there was no official figure until late evening. One image that was widely circulated on social media was of a man in flames (pic) posted on a blog report about the violence in Tikapur. 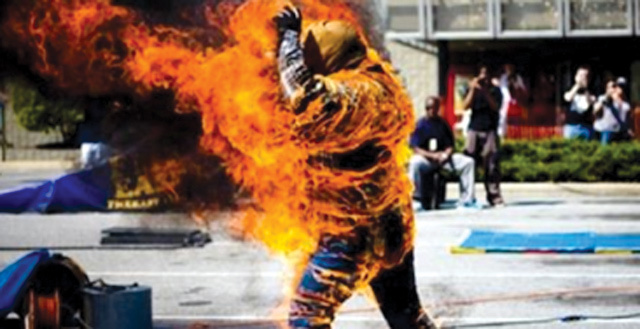 Although there was no caption or photo credit, the image accompanied a report about a policeman being burnt alive. At South Asia Check we found that the image was actually from a US-based website posted in 2012 of some other incident. Digital portals like Setopati and ekantipur also carried reports about the fake picture, and that magnified our reach and allowed the correct information to spread. Although the Setopati piece about the misleading image was shared almost 6,000 times across social media platforms, it paled in comparison with the hate speech and fake pictures depicting the Kailali killings on people’s social media timelines. Amidst all the noise magnified by frantic tweeting/retweeting even by senior politicians and journalists the violence in Kailali had spilled over into social media. The next day South Asia Check started receiving requests for fact checking from readers of similar misleading pictures being circulated online. Although not all the images could be tracked to source, it was clear that many of the graphic pictures of charred bodies being shared online as depicting victims of the Tikapur violence were not from there at all. Some were so graphic they couldn’t even be posted on the South Asia Check website. Following the violence in Tikapur, the Tharuhat/Tharuwan Joint Struggle Committee released a press statement condemning ‘the killings of hundreds of men and women shot blindly during the ongoing protest for autonomous Tharuhat’. Further checks showed that the real figure was nowhere close to this. Amidst the conflicting number of death reported in media, the Office of the UN High Commissioner for Human Rights also released a statement condemning the violence but wrongly saying that the father of the two-year-old who was killed in Tikapur also died in the violence. When there is competition to break news first, it often results in inaccurate reports. The coverage of the unfolding violence in Tikapur on Monday last week underlined how easily crucial elements of a developing story are overlooked. Sharing misleading images recklessly on social media can further fan hatred and revenge. Wrong claims by politicians in the media can also aggravate the situation. South Asia Check hopes to correct falsehoods in public officials’ statements, and in the mainstream and social media immediately so as to promote responsible politics and accountability among public officials and the media. Fact checking is an inherent part of the media in many parts of the world, and we hope it will foster the growth of correct and credible information and images in Nepali newsrooms and the social web as well. Bhrikuti Rai is a reporter with South Asia Check.